Plz guide me..if i want to give my child iron as a seperate supplemnt,omega 3 seperate and vitamin d as a seperate suppliment..how would i give her?all the 3 thing same day at same time?should i seek doc or i can give these to her on my own. Hi Sehrish! You can certainly give your child all three supplements separately, and since all 3 are liquid supplements for kids, you could add them all to her favorite drink or meal at the same time – and just mix it in each day. But before you do, I’d recommend talking to your pediatrician first to see if your child needs an iron supplement. Omega 3s and Vitamin D are beneficial for all kids, but iron isn’t necessary unless your child has been diagnosed with low iron or anemia already. So I’d get that test done and talk to your pediatrician before going with an iron supplement. Hope that helps, let me know if you have any other questions! Hello! You have a wonderful website with such useful information – thank you so much! I would love to give my 3.5 year old son a multi vitamin perhaps with a probiotic however I cannot find a liquid form that is all natural all singing all dancing. I have tried a natural powered probiotic and an all natural tablet form vitamin all without luck. Could you please suggest one? Gummies are a no no. Thank you. Hi! Thank you so much! Just to make sure I understand your question – you’re looking for a liquid vitamin that has a probiotic included in it? If so, this one from Bio Naturals is the best one I’ve found. It does have “natural flavors” in it – but the rest of the ingredients are pretty clean and I haven’t found one that has a cleaner ingredients list yet. Hope that helps, let me know if you have any other questions! Thank you for this great post. There is SO much information here. 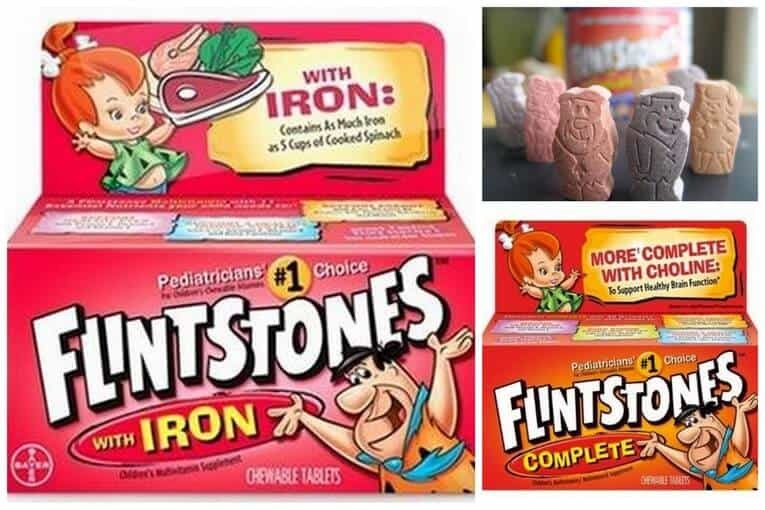 I’ve been trying to find the “right” vitamins for my son. Can you recommend a gummy multivitamin that has everything he needs as far as immunity/ multivitamin but also includes fiber/ digestive probiotics. He’s 10 and struggles with irregularity. Thank you so much! Hi Nadina! I think you might have to put together a couple supplements to give your son everything you want to add into his diet. For example, Olly Kids makes a gummy multivitamin that has probiotics (but no added fiber), and Garden of Life makes a great gummy vitamin with fiber but no probiotics! I’d recommend getting the Garden of Life one which has the added fiber, and then using this probiotic from Garden of Life that you can add to any drink or food. Hope that helps! Thank you for this information! My son has been getting miagraines, especially when playing sports. I’m going to try supplements, but was wondering what you recommended for magnesium oxide for kiddos as well. And which of those in your list would you recommend if the kids need a methylated form? Hi! So sorry to hear about your son’s migraines! That sounds so rough! Regarding magnesium oxide, I honestly have not found one that has clean ingredients and is made for kids. All of the magnesium oxide supplements I’ve found are for adults (and the kids versions are other forms of magnesium – not oxide). Sorry about that! If your son needs methylated B vitamins though, I’d recommend Thorne Research which is a great option! 🙂 Hope that helps! Thanks for all the amazing information. 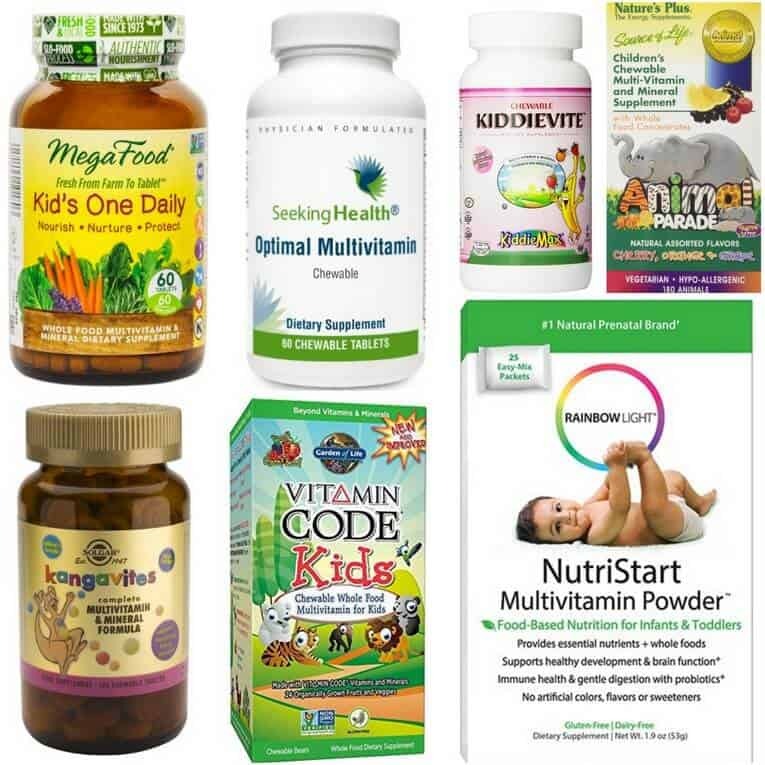 I am wanting to use a multivitamin and dha but having a hard time finding one with a good combo. My son is already on a probiotic so I don’t need that combined with it. If I look at the cod liver oil or other omega supplements it also has some vitamins in it and I am concerned about combining those. Hi Ryane! I’d recommend using Nordic Naturals’ Vegetarian DHA — because that doesn’t have any other vitamins added to it. So that way you can do the multivitamin, probiotic and this all separately! Let me know if that works! What is your opinion about “NovaFerrum Multivitamin with Iron Supplement for Infants” ? We use this one for our 2 year old. Now we want to try something else. Hi! NovaFerrum isn’t as good as the iron supplement I recommend – Nature’s Nutra because it has more artificial ingredients added like “natural flavor” and “natural color” – which is basically just artificial flavor/color. So I’d go with Nature’s Nutra instead. Hope that helps! Hi Shanon! 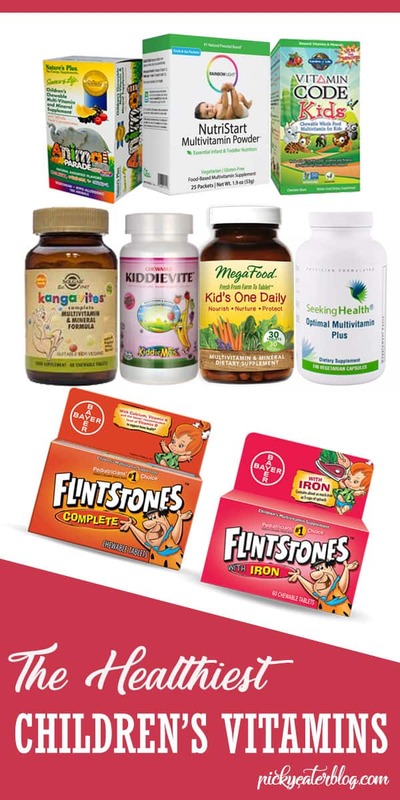 Haha no problem at all 🙂 For your daughter – the most “comprehensive” vitamins on this list are probably Children’s Best, Thorne Research and Garden of Life. So any of those would be good options for her. And for an added immune boost I’d recommend Olly Kids Immunity which should help too! Writing once again to thank you for your suggestion but found the ones a bit weaker with less than we needed. We have discovered shellfish allergy unlike peanuts egg soyor gluten harder to find excluded in the multivitamins out there. Hi Mary! Did you see my other reply to your comment? Children’s Best is a great option for you – there is NO shellfish in that vitamin! Thanks for the post. I contacted seeking health about the prop 65 warning and they said it is because of the vitamins that come from the earth. This confuses me a but because it seems like it is synthetic and not a whole food vitamin? And why do they have when comparable brands dont like Thorne, pure ecaps, Klaire etc. Are they just being proactive and they all do or should they be avoided because they have a warning lead? I really like what is in them more than the others but this concerns me. Thanks! ** For carcinogens, the threshold is called the No Significant Risk Level (NSRL), which is the level of exposure that would result in no more than one excess case of cancer in 100,000 individuals exposed to the chemical every day for 70 years. In other words, a person exposed to the chemical at the NSRL for 70 years would not have more than a one in 100,000 chance of developing cancer as a result of that exposure. ** For reproductive toxicants, the No Observable Effect Level (NOEL) is determined by identifying the highest level of exposure that has been shown to pose no harm to humans or laboratory animals and dividing the NOEL by 1,000. A warning is required for exposures that exceed 1/1000th of the NOEL. In other words, California sets a level that is 1,000 times lower than the level of exposure that has been shown to have no observable effect on humans or animals. The latest few comments mention Naturelo vitamins which many find to be a TOP choice. one of these comments stated that they were free of shellfish as well as other allergies.. I rechecked and found that Naturelo IS NOT to my knowledge fish or shellfish free..if you could check on this, it could help the many of us that have the shellfish allergy…and where we can find a good shellfish free multivitamin. Hi Mary! Children’s Best has no fish or shellfish ingredients! So that should be a good option for you! Hi. Would you suggest anything from this list? Naturelo isn’t bad but they have “natural flavors” on their ingredients list which is basically artificial flavors. The rest of their ingredients look ok though! Xtend-Life also looks pretty good but they have maltodextrin on their ingredients list which I don’t love. Dr. Mercola has mannitol (sugar alcohol that can disrupt digestion) and “natural flavors” = artificial flavors added. The rest of the ingredients look good though. Garden of Life I already recommend! Solgar is on my “runners up” list because it has Carrageenan so I wouldn’t buy that if you can get one of the other ones on my list. Trace Minerals has 4 different types of “natural flavor” added, which again – is basically the same thing as artificial flavor. Usanimals have “natural flavors”, soy lecithin and “stevia” – not organic stevia leaf extract which I don’t love. Hi, this is such a great article. Is there a children’s mulit that is just a regular swallow tablet or capsule? My picky 10yr old won’t eat the chewables or gummies. She does take medication on a daily basis and has no issue with swallowing pills. Thanks for the help and I look forward to exploring your site. Hi! I’m so glad you found this post helpful! Thorne Research’s vitamins are regular swallow tablets/capsules. So they’d be a great option for daughter! Let me know if you have any other questions! Great information! Have you come across a multivitamin with Zinc that you would recommend? Hi Anjali, what do you think of Vitaminfriends Boost Appetite? My two year old son is low in iron and has lost most of his appetite. Hi Cresencia! The ingredients in that supplement look ok to me! The only “on the fence” ingredient is the “natural flavors” it has, which most likely is artificial flavors, but everything else looks great. But I don’t know much about how effective it is. Has your pediatrician voiced a concern about your son’s weight? The reason I ask is that it’s very common for toddlers to start eating a little bit less because they’re usually more interested in playing. But if your son is losing weight or underweight I understand the need to boost his appetite. Have you also considered an iron supplement for his low iron? If you need one, I really like this one from Nature’s Nutra. Hope that helps, let me know if you have any other questions! Another option I like is Naturelo Children’s multivitamin. It is a chewable, but they also offer a whole food vitamin in gummy form. I use the same brand for my vitamins and supplements as well. They’re non-gmo, contain no gluten, dairy, eggs, shell fish, soy, artificial flavorings or preservatives. They’re also vegetarian and vegan friendly. Hi Chance! Naturelo is a good brand and I love their adult vitamins, but their kids vitamins have “natural mixed berry flavor” added which is basically artificial flavoring. But other than that the rest of their ingredients look good! Hello. I truly have read through this post, the comments and links. I am so lost. Especially with the tons of comments. I have spent almost a week and still have no vitamins. LOL Can you please help me? Daughter is 11 years old. Started menses and Bone Cancer survivor. She needs extra vitamin D. She also has ADHD so would like fish oil and magnesium. I am leaning towards smarty pants multi but is there something that is a multivitamin with magnesium, probiotics, vitamin D3 (Smarty pants just shows vit D) and omega 3’s instead of taking multiple things. Also, no iron test so don’t know about that. Please, Please give me your recommendation. Also, can’t I just by the adult but modify the dose. ( Maybe I can share) PS. She does not eat a rounded diet. Thanks for all you do!! Hi Savannah! Aw no prob at all!! Happy to help 🙂 First of all can I just say that your daughter sounds amazing!! I can’t imagine what you both have gone through with her cancer and everything else that goes along with it – you are both so strong! Regarding adult vitamins – the general recommendation is to wait until age 12 to give adult vitamins to kids — so your daughter is almost there. In a year, I bet you could just share a women’s multivitamin but until then you should probably stick to kids vitamins for her. Regarding iron, I’d get her tested before giving her an iron supplement. You can use this Smarty Pants Multivitamin which has Vitamin D, Omega3s and Probiotics added – so it’s all in one! Hope that helps, let me know if you have any other questions! I am looking for a liquid or powder form multivitamin for my 18month daughter. I prefer no iron. Is this safe for her age range? Are there any multivitamins you would recommend other than Zarbees? Hi Shaniqua! If Mega Foods says for ages 5+ it’s probably not a good idea to give it to your 18 month old! Instead, I’d recommend Children’s Advanced – it’s a liquid vitamin, it has no iron, and it’s for kids aged 1 and up. Hope that helps! Thank you so much for responding. This has been an overwhelming process. No problem at all! Regarding iron – I wouldn’t supplement her with iron unless she is actually anemic. So the first step there is to get her iron levels tested at her pediatrician’s office — and if you need an iron supplement after that, let me know and I can recommend one. And for now, the Children’s Advanced multivitamin should be fine because it doesn’t contain iron so you don’t have to worry about that. Hope that helps, let me know if you have any other questions! Are any of the gummy’s real soft and easy to chew? My daughter has sensory issues and low oral muscle tone and if the gummy is too tough then she will get either too tired chewing or get gagged and throw up. Most the gummy’s we have tried are really tough for her to chew. Hi Jon! Honestly, I’m just not sure as I haven’t tried out all of the gummy vitamins listed myself (and my kids don’t like gummy vitamins, they prefer regular chewables). My suggestion would be to read through some of the reviews of the vitamins to see if any are highlighted as particularly tough to chew and use that to narrow down the list! Ok, I’ll try to battle through them and see if anyone mentions if they are tough or not. Are the chewable smile your kids like easy to chew? I’m not dead set on gummies, just trying to figure out anything to help her progress until she can chew tougher things. Thank you for responding and all you do. In addition to my comment I’m wondering your thoughts on airborne and emergen-c brand? Hi Sarah! I wouldn’t recommend either. Airborne has artificial flavors and sucralose (which is splenda, fake sugar) added; and Emergen-C has maltodextrin and Rebaudioside A – which is marketed as stevia extract but is actually a highly processed form of non-organic stevia that I wouldn’t recommend – added. One of the vitamins on this list would be a much better option! Hi Sarah! No problem! 🙂 Olly Kids Immunity is what I would recommend! Can you confirm if OLLY Kids Immunity has gelatin which is animal derived or not? Hi Sarika! The gelatin in OLLY Kids Immunity comes from both cows & pigs so it is animal derived, and not vegetarian friendly. Have you heard back from Nature’s Plus regarding the Prop 65 warning? They seem to be the only sugar free non-gummy vitamins I can find for my 3 year old son. Are there other alternatives you would recommend? He’s also allergic to tree nuts and sesame seeds. Hi Geselle! Unfortunately I haven’t! For an alternative, I’d recommend trying Vitamin Friends – which is a gummy vitamin that is also allergen free. Hope that helps!